Open to all artists 18 years and older. 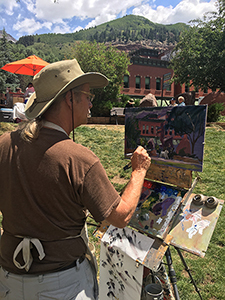 The 2019 Telluride Plein Air application will be available online from October 15, 2018 through November 30, 2018. Submission fee is $50 per person & includes 3-5 images and one bio/resume. Late registration ends December 31, 2018 with an additional $10 fee. Requested data will include the submission of three-five painting images (plein air works only please) and a bio/resume of past art shows and awards. Each artist must submit 3-5 images of their Plein Air artwork in JPEG format, color space preferred format with a resolution of 300 DPI (max 4000 pixels on the longest side) as part of the online application process. If you have a Macintosh, please use only letters and numbers in your filename and only 1 (.) period. Also, Apple recommends using Safari for your browser. Help and tips on photographing your work and getting to the proper size can be found at http://www.juriedartservices.com/index.php?content=help:tutorial. Help entering images, questions or concerns can be directed to support@jurying.net. The Telluride Plein Air Celebration is a juried exhibition consisting of a panel of 3-5 jurors. The panel will review all submitted applications and select between 15-20 artists for a total of 20-25 artists to participate in the 2019 event (the top five revenue-generating artists of 2018 are invited back for the 2019 event). Notification of selected artists will be sent to each applicant via email no later than January 22, 2019. Artist agreement forms will be emailed to those who have been accepted following the announcement. All artwork must be completed in the Telluride area between June 30 and July 6, 2019. Canvases will be stamped with an approved insignia as they arrive. Only artwork with this stamp will be permitted in the Exhibition & Sale. In addition, all works must be suitably framed with proper backing. Wire hangers or a suitable hanging device must be attached and ready to hang. Artists are asked to paint a minimum of eight paintings of varying size. This event is a fundraiser for the Sheridan Arts Foundation and the Historic Sheridan Opera House, a 501(c)(3) non-profit. The sale takes place outside the Sheridan Opera House and in Elks Park for three days over the Fourth of July holiday. The Sheridan Arts Foundation will retain 40 percent of all sales revenue generated throughout the sale. Commissioned pieces will also be permitted at the above-mentioned rate. Artists should expect to be on-site all three sale days at their booth. Payments for all work sold will be mailed shortly after the exhibition closes. Host lodging is available to each participating artist and spouse at no charge for seven nights beginning June 30, 2019 (we ask artists to NOT request additional lodging nights with their host). If an artist plans on bringing additional family members (i.e. children) or pets, they will be responsible for providing their own accommodations. Artists are also responsible for providing their own transportation to, from and around Telluride, Colo. Please note that the event dates are confirmed, but the detailed schedule is subject to change.